Born into a long-established Champagne family, Jean Louis studied winemaking and business, then went to work for Boschendal in South Africa making 'Cap Classique' fizz. 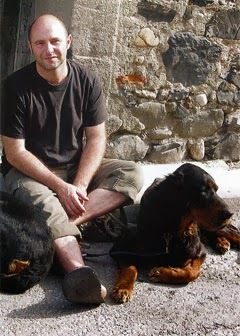 He also travelled around Australia, New Zealand and the US to take in what else was going on in the wider wine world. When he returned to France, he created a sparkling wine brand sourced from just outside the Champagne area that was big in the USA apparently. 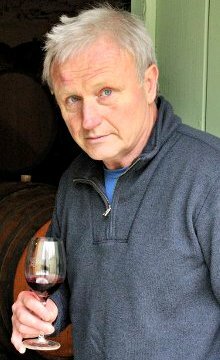 He bought his first Pinot Noir and Chardonnay vineyards in Limoux country in the late 1980s, followed by planting Champagne clones of Pinot in the early 90s to make fine sparkling wines. This expanding estate was to become the now relatively famous Domaine de l'Aigle, which was sold to Antonin Rodet and now belongs to the Gérard Bertrand group. 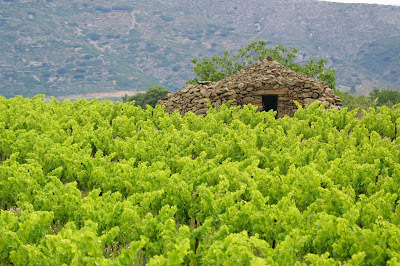 This cooler spot, with some vineyards lying at over 300 metres above sea level, was also considered a good place for making later ripening finer styles of Cabernet (both) and Merlot; and are part of a total of "57 parcels," as Jean Louis describes his patchwork estate, including the aforementioned Roussillon sites. More @ www.jldenois.com. 2011 La Bourdette Cabernet Franc (13.5%) - nice 'sweet/savoury' fruit, berries with 'soy sauce' tones; dry and firm vs rounded too with a touch more obvious oak than the Syrah say. 2nd day – that oak has blended into the wine better, ripe rounded texture vs structured and 'fresh' tannins, well balanced and quite elegant with a little weight and light coconut grain. Also needs a bit longer to open up. 2008 Reserve Merlot - a bit oaky to start (surprising after 5 years) although has nice smooth tannins, quite rich plum and chocolate flavours, dry vs rounded profile; was even okay with a Chinese pork dish. Turns more savoury after being open, showing liquorice and a wilder earthy fruit side, nice tannin texture and depth of fruit vs chocolate oak edges; more 'volatile' and oxidised after two days open (not surprisingly). 2006 Pinot Noir brut Vin Mousseux de Qualité élaboré en Méthode Traditionnelle' (12%). Intricate toasted nut and Fino notes on the nose, baked oats straw and honey vs floral red fruity mix, chocolate and bread tones too; rich toasty nutty and yeasty flavours, concentrated with fine tight acid structure still, fresh and dry vs all those lingering complex aged flavours, delicious and classy. Maturing vs still young, will keep longer yet it's lovely now; tastes like Vintage Bolly. More of his wines from the northern Roussillon HERE. Or Dobbin vs Porter, Kilkeel vs Kent, Ireland vs England if you like... Described as a "ruby porter style beer," which does pretty much sum up Clotworthy Dobbin (5.0% abv, £1.79 a bottle I think in Asda Northern Ireland stores and widely available elsewhere over here) brewed by the Whitewater Brewery found a little inland from Kilkeel in the southern Co. Down countryside. Not quite as rich and dark as a full-on stout but definitely in that malty 'porter' ilk, smoother perhaps too. Surprisingly nice with curry actually. I also like that short and sweet ingredient list - malt, barley, hops, water, yeast - i.e no unnecessary rubbish in it for a change. Whitewater produces a good range of various beer styles overall from Belfast Lager to this one to maltier still. Well-known, and probably much larger Kent brewer Shepherd Neame makes ASDA's 'Extra Special' Whitechapel Porter Ale (5.2% abv, £1.80), which is lush and chocolatey with attractive bitter-sweet finish. More quaffable than say Guinness, and more interesting perhaps with a different array of flavours. Just about works with (dark) chocolate, this is a tasty slow-sipping by-the-radiator ale that would go well with winter stews. 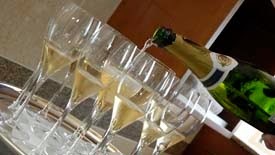 Don't miss the bubbling-with-excitement Wine Education Service NI Champagne & Sparkling wine tutored tasting evening, rolling out and upwards on Tuesday December 3 (7 to 9 pm) at the Ramada Encore in Belfast City Centre. Your fizzed up host RMJ will take you on "...a fizzy world tour through France with classic Champagne and other fine sparklers, then comparing with the ever popular Cava (something different and better than usual though...), Italian 'new kid on the block' Prosecco, passing through the southern hemisphere e.g. Australia, New Zealand, and ending up in England..." (you'll be surprised if you haven't tried top English fizz). Tickets are just £30 per person and can be booked via the link on this page: wine-education-service.co.uk/wine-tasting-belfast, where you'll also find the detailed program for the first half of next year. Or pay by PayPal using the button below (and for other tastings next year too). And if you're a regular user of Local Wine Events.com, you can get in touch with me from this page: www.localwineevents.com. Next year's scheduled WES NI courses and events include: Essential Wine Tasting five-week course and Grape to Glass one-day workshop (Feb 2014), Tour de France tasting (March), Wines of Italy Sat. workshop (April), Aus & New Zealand tasting (May) and Syrah/Shiraz tasting (June). More info: wine-education-service.co.uk/wine-tasting-belfast. Domaine des Trois Orris (Tarérach) by Joep Graler - know anyone else who does a Chenanson aged in acacia and chestnut barrels?! And "coming soonish" (okay, I've been saying that for two years), the Roussillon wild wine country touring guide. Updated, rewritten, restructured and repackaged; available in three formats (e-book, print-on-demand paperback and simple PDF doc). Just have to finish the damn thing first! Overseen/run by father/son Henri and Philippe Modat, who are originally from the Roussillon and "came back to the old country and took over some old family vines," after various high-profile legal and business careers in Paris. The estate was thus established in 2007, which comes to 20-something hectares (50+acres) in the Cassagnes area (circled by the villages of Montner, Latour, Rasiguères and Bélesta) lying on a "200 to 300 metre altitude plateau." The main intro page on their website (goes there) doesn't mention some of the white varieties I was told are in the 'de-ci de-là' blend - maybe because they really are picked "from here and there," as the name implies, from the odd white vine mixed in with the reds - but does say that four ha of Grenache blanc, Viognier and Roussanne were planted in 2009. Anyway, the dominant grapes by far are Syrah and Carignan, some of the latter dating from 1905 and 1930. Under the guidance of vineyard manager Laurent Abet, they're in the process of converting over to organics, with all the usual 'green' practices and philosophy that involves. Their groovy eco-friendly cellar, fitted with solar panels supplying more than enough electricity to power the winery, they claim, was built in 2008, the year of the Modat family's maiden vintage. As suggested above, Philippe's wines have quirky personal, and rather cute, names with reds dominating the field; the ones profiled here are labelled under the Cotes du Roussillon Villages Caramany sub-appellation, which includes Cassagnes (don't ask). Hence 'comme avant' (“like before” or “in the old days"), 'sans plus attendre' (“without waiting any longer” or “without further ado” perhaps) and “the nicest one” or 'le plus joli'... These wines are available in the UK and Ireland from James Nicholson (= the second pair of prices in £ and € - the first € price quoted is cellar door or delivered in France). Going there: “Les Plas”, 66720 Cassagnes. Phone 04 68 54 39 14. 2009 le plus joli (2/3 Syrah, 1/3 Carignan, old vines in the highest sites) - pretty heavy on the coconut to start vs that lush dark fruit again, the oak lingers a little vs very structured and tight wine still for a 2009; attractive tannin texture though, would like to try it again when it's opened up more. Dear too at €38 cellar door. "'Malbec from Argentina' is hogging the fashion limelight nowadays, and a good deal of this sizeable country's vineyard area on the simplest level; and Syrah has also now invaded the varietal catwalk here. But we shouldn't forget another better-known mainstay red variety, and often more successful in quality, consistency and style terms; good old Cabernet Sauvignon..."
Buy my full-works 12-page Argentina report for just £2.50 (less than $4 or €3.50) using the PayPal button below, including wines from and comments on: Zuccardi, Trapiche, Schroeder, Toso, Fournier, Bosca, Lurton, Alpamanta, Bousquet, Dona Paula, Catena, Andeluna; and Alta Vista, Salentein, Callia, Sophenia, La Riojana, Torino, Sta Anna, Trivento, Masi, Sta Julia, Viñalta, Las Moras also featured in recent articles on Malbec and Torrontés as well. Use the PayPal below to pay by card or your own PP account, but you don't need one to do so, and I'll email the PDF file once I receive confirmation. This material isn't free2view any more! General T&C referring to Paypal payments by bank/credit card and your privacy etc. can be found here.